It all started as a small Christmas bazaar, but after four decades, Edgewood’s annual Heritage Festival has turned into a celebration of rural life, community sharing and — equally important — good eats. The day long event is always scheduled on the second Saturday of November and features a variety of family-friendly exhibits and activities. Vintage cars and antique tractors are on display with one of the largest classic car shows in East Texas.Meanwhile, a model train exhibit and demonstration in the park’s train depot also pays homage to simpler times and showcases eye-catching vehicles on a smaller scale. Edgewood’s Heritage Park area bustles with folk art exhibits as artisans and vendors demonstrate age-old skills like blacksmithing, manual printing, weaving, hand quilting and soap making. And shoppers keen on finding unique and handcrafted Christmas ideas find inspiration amid the festival’s varied offerings from painters, wood sculptors and others. Of note, local artist Tori Walker, annually designs a new collectible Christmas ornament bearing the likeness of one of the buildings in Heritage Park Museum. For foodies in the crowd, members of Edgewood’s Historical Society sell a wide array of baked sweets along with homemade bread and pies from locally grown fruit. Early in the day, the goodies are sold at Gilliam Grocery Store, but veteran visitors know to arrive early as they sell out quickly. Similarly, jams and jellies are plentiful and include every sort of combination with jalapenos — blueberry, apricot, peach — plus the ever-popular Christmas-colored red or green pepper jellies. Edgewood’s food court remains a big draw with home-cooked dishes ranging from pinto beans and corn on the cob to turkey legs, sausage sticks and homemade ice cream. 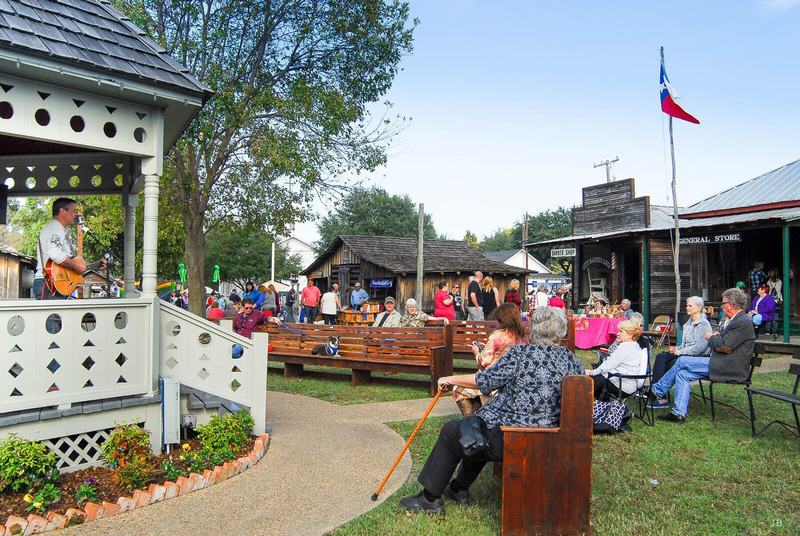 The proceeds from the festival go to the future development and maintenance of the Heritage Park Museum of East Texas. 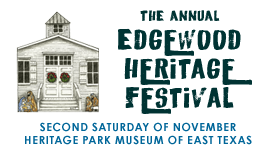 Festival hours are 8:45 a.m.- 4 p.m.; located at U.S. Hwy 80 and FM 859, Edgewood, Texas.